A recent workshop was held in Perth city in the state of Western Australia on November 15 with a focus on the education system of Vietnam. A representative of Vietnamesestudents present flowers to teachers at the event. 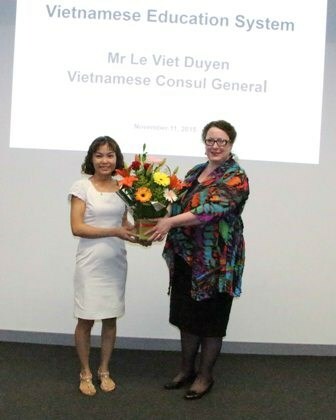 The event was jointly organised by the Consulate General of Vietnam in Perth and the Edith Cowan University (ECU) on the occasion of Vietnam’s Teachers’ Day (November 20). It saw the participation of crowds of professors, lecturers, managerial staff and Vietnamese and international students from local universities. Consul General Le Viet Duyen highlighted the Vietnamese love for study and the development of the education system of Vietnam. He noted that more than 30,000 Vietnamese students are pursuing education in Australia, with nearly 2,000 of them studying in Western Australia, who will play an important role in Vietnam’s development as well as in fostering the friendship and the comprehensive relation between the two nations. The diplomat expressed his hope that universities in Western Australia will offer more exchange programmes for students, teachers and researchers with Vietnam in the future. On the occasion, the Viet Education Link Association made debut with the aim of connecting educational institutions of the two nations and promoting Vietnamese culture and Vietnamese language teaching programmes in Australia.